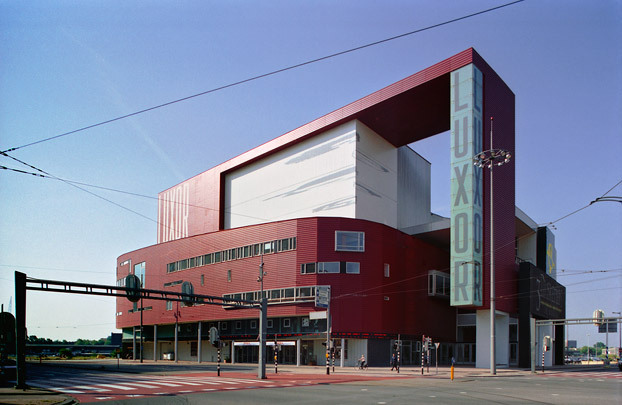 Nestling in the heart of Kop van Zuid, the Luxor Theatre abuts the principal local traffic intersection but is also sited along the water. The prevailing colour is red. Its materials and the formal syntax tread a path between robust naval architecture and the intimate and festive theatre ambience. The auditorium is broad and shallow and can accommodate some 1500 theatregoers. Ranged round it is a network of larger and smaller foyers, stairs and refreshment kiosks to encourage the audience to take an informal look round and meet others during intermissions.